The Wonderful Wizard of Oz is one of the world’s best-loved fairytales. As Judy Garland’s famous film nears its 70th birthday, how much do its followers know about the story’s use as an economic parable? Dorothy in Kansas conjures up nostalgic thoughts of childhood Christmases hiding behind the sofa from the Wicked Witch of the West. Or those flying monkeys. It’s unlikely its young fans will have been thinking about deflation and monetary policy. But the story has underlying economic and political references that make it a popular tool for teaching university and high school students – mainly in the United States but also in the UK – about the economic depression of the late 19th Century. At a time when some economists fear an onset of deflation, and economic certainties melt away like a drenched wicked witch, what can be learnt from Oz? The 1939 film starring a young Judy Garland was based on Lyman Frank Baum’s book, The Wonderful Wizard of Oz, published in 1900. It told of an orphaned Kansas girl swept by a tornado into a fantastical world, but who wants to return home to her aunt and uncle. Thinking the great Wizard of Oz can grant her wish, she sets out to meet him with her beloved dog, Toto, joined by a scarecrow, a tin woodman and a lion. Baum published the book in 1900, just after the US emerged from a period of deflation and depression. Prices had fallen by about 22% over the previous 16 years, causing huge debt. Farmers were among those badly affected, and the Populist political party was set up to represent their interests and those of industrial labourers. The US was then operating on the gold standard – a monetary system which valued the dollar according to the quantity of gold. The Populists wanted silver, along with gold, to be used for money. This would have increased the US money supply, raised price levels and reduced farmers’ debt burdens. In 1964, high school teacher Henry Littlefield wrote an article outlining the notion of an underlying allegory in Baum’s book. He said it offered a “gentle and friendly” critique of Populist thinking, and the story could be used to illuminate the late 19th Century to students. Since its publication, teachers have used this take on the tale to help classes understand the issues of the era. Oz: An abbreviation of ‘ounce’ or, as Baum claimed, taken from the O-Z of a filing cabinet? And Littlefield’s theory has been hotly debated. He believed the characters could represent the personalities and themes of the late 1800s,with Dorothy embodying the everyman American spirit. US political historian Quentin Taylor, who supports this interpretation, says: “There are too many instances of parallels with the political events of the time. Bryan was a Democratic presidential candidate who supported the silver cause. But he failed to win votes from eastern workers and lost the 1896 election. In the same way, the Lion’s claws are nearly blunted by the Woodman’s metallic shell. The Wicked Witch of the West is associated with a variety of controversial personalities, chief among them the industrialist Mark Hanna, campaign manager to President William McKinley. In this scenario, the yellow brick road symbolises the gold standard, the Emerald City becomes Washington DC and the Great Wizard characterises the president – and he is exposed as being less than truthful. Yet none can help Dorothy return home. 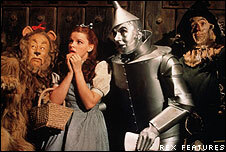 Eventually she discovers that her silver shoes (changed to ruby for the film) have the power to take her back to Kansas. The possible implication is that gold alone cannot be the solution for the problems facing the average citizen. But Professor Taylor thinks it’s unlikely the book took sides. Instead he says it was merely explaining the story of the Populist movement, some of whom marched on Washington DC in 1894 to demand government improve their plight. Their demand for the use of silver with the gold standard was not met, although within a few years, inflation returned after discoveries of gold in South Africa and other parts of the world. In Baum’s story, Dorothy loses her silver slippers in the desert before she reaches home – a possible reflection of the decline of the silver cause after 1896. But not everyone believes The Wonderful Wizard of Oz includes any hidden meanings. “Nobody ever suggested it until 1964,” says Bradley Hansen, who is a professor of economics at the University of Mary Washington. 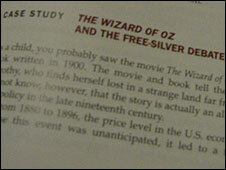 Professor Hansen thinks the author was just trying to create a new kind of fairytale, the “Harry Potter of its time”. Soon after publication, Baum adapted his book into a stage musical for adults which opened in 1902. Ranjit Dighe, who wrote The Historian’s Wizard of Oz, says it poked fun at Theodore Roosevelt and the Populists, but Baum was playing for laughs, like Jay Leno. Little can be learnt from Baum about the modern economic crisis, says Professor Taylor, although in both instances people have demanded more government action. The Bank of England has – as the Populists more than 100 years ago demanded – provided a boost to the monetary supply, although the term “quantitative easing” was probably little known in the 1890s. And ultimately the US defeated deflation by creating money from new discoveries of gold abroad. L Frank Baum died before the debates over his true intent had started. But in the book’s introduction, he stated that he was only writing to please children. He was no doubt unaware of its future appeal to economics students.